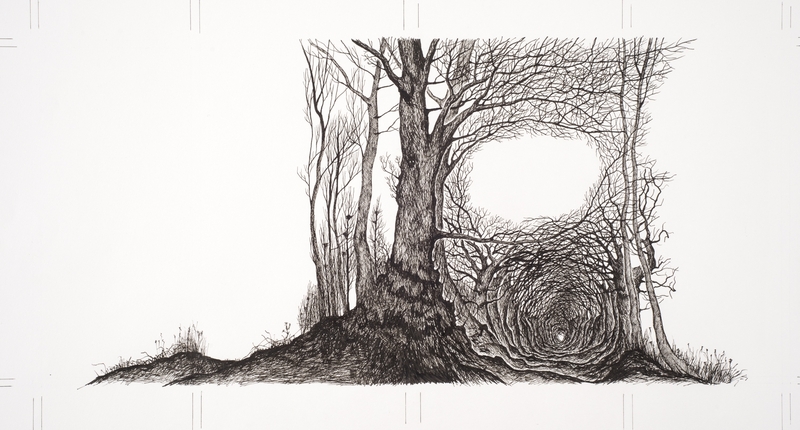 Stanley Donwood makes beautiful art and has connections to some of my favourite writers – Roger Deakin and Robert Macfarlane, and is also Radiohead’s in-house artist. His choice of name for the title of his latest exhibition caused a large outbreak of excitement in my family. Without implicating anyone in decades old criminal activity, it is safe to say that there is a direct and enduring link between us Halls and the slogan, daubed on a wall on the trackside outside Paddington station stating enigmatically ‘Far Away is Close at Hand in Images of Elsewhere’. 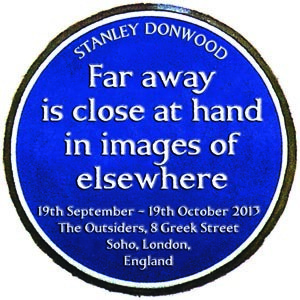 Donwood’s revival of the slogan provides a memorable title for his hugely striking exhibition at the Outsiders, 8 Greek St, London until Saturday 19 October. Holloway, his work with Macfarlane and Dan Richards, features works that make up much of the exhibition, which can be viewed here larger and close up. 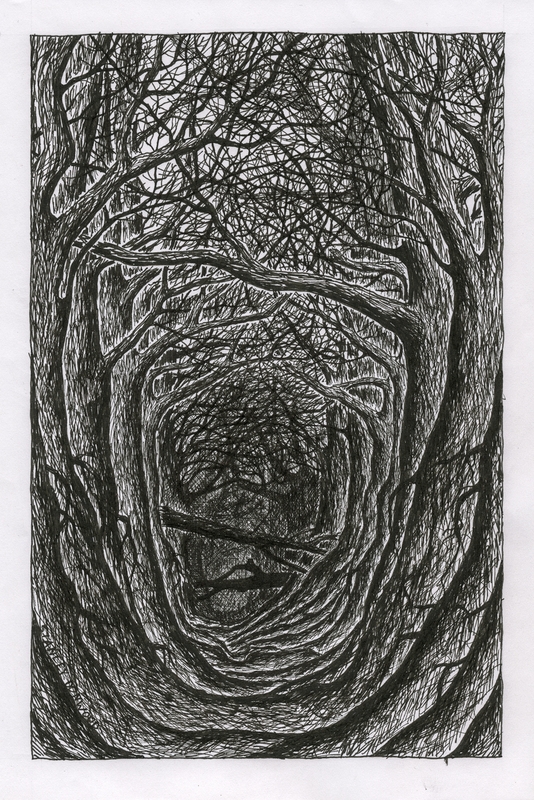 They convey the raw and mysterious atmosphere of the area of Dorset that hid the sunken lanes inspiring the work. Now the lanes are, by all accounts, gone. I was lucky to go to the area of Dorset where they’re found but my own exploring was restricted to some of the Iron Age hill forts that dot the landscape. 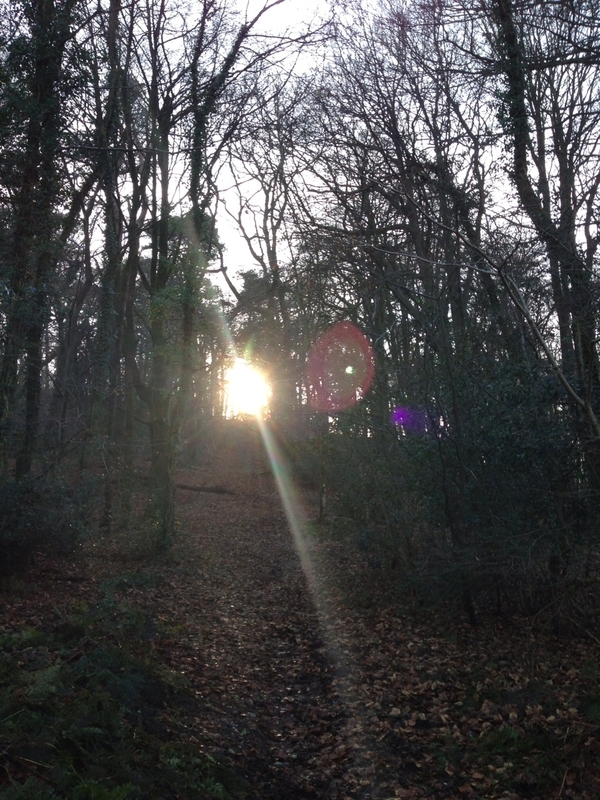 They offered a taste of what the holloways must have been like. The highlight of Far Away… for me was the coloured forest scenes on the ground floor, including the huge, mesmerizing colour painting that forms the centrepiece of the show. You half expect Pan himself to emerge from the blazing light at the centre of the piece. I won’t reproduce it here as to do it justice you have to see it full size and close up. You can find it on the Outsiders site below. The full image of the Holloway jacket, below looks lovely too. Go and see this superb show if you’re at all able. It may inspire you to pick up a brush and get busy somewhere. So Istanbul is deeply wonderful. A great destination. I’d usually recommend staying on the Pera (Beyoglu) side of the Golden Horn, still in Europe but not in Sultanahmet, unless you fancy the Empress Zoe where Imogen and I stayed (emzoe.com) – it’s a very lovely hotel right in the heart of Sultanahmet in an old Byzantine cistern, so if you can stay there I would. If not the Maramara Pera is also nice but bigger and different and just off Istiklal Cadessi, their Oxford St and so good for eating out and what-not. Even if you stay at Empress Zoe you should cross the bridge to eat. So, first morning, get yourself to Hagia Sophia early. It opens at 9 and if you’re in the queue you get a bit of peace. It’s big enough for the crowds to be absorbed but nice to have to yourself. If you go straight upstairs you’ll have even more quiet. There’s a grafitto of a medieval galleon to be found on one of the pillars – see if you can spot it! After experiencing Justinian’s triumph you’ll probably need a lie down (Procopius’ The Buildings is a scholarly companion). Watch out for fat American bottoms on white marble outside. this is all that remains of Theodosius’ basilica on the same spot.Don’t put your bottom on it but ponder what happened to Theo himself. Died while riding. Theodosius II is also a fine figure in our story for another reason. He built the huge land walls that you pass as you comein from Ataturk Airport. They were so mighty a bastion none could pierce them until Venice in 1205 and The Turks in 1453. They’re well nang. From here, Little Hagia Sophia (Kucuk Aya Sofya) is a short walk and a lovely mosque. It was also built by our old mates Anthemius of Tralles and Isidor of Miletus who came up with HS. There’s a lovely quiet tea garden next door and some artisan shops which we got some nice goodies in when there last time. Another belter the other side of Hagia Sophia is the National Archaeological Museum. Not dry! Look out for the Sublime Porte, from where the Ottoman Empire was governed and obsequious ambassador’s grovelled. Ataturk put a stop to all that, but it’s also worth considering that the Greeks came pretty close to getting Constantinople back pre-1923. Then Ataturk passed the Turkish Postal Act which decreed mail addressed to Constantinople would not be delivered. Couldn’t have the same impact today. Ah yes, I remember now, then you can walk through Gulhane Park, pausing at the Barabarian’s Column, and have a Turkish Coffee at Seraglio Point. Anyway, National Archaeological Museum. Worth it for the Alexander Sarcophagi alone. They still have their paint on them. Astonishing. Look out also for the length of chain that was part of the barrage the Greeks suspended across the Golden Horn in time of need. Along with their ability to propel flames out of primitive fire-hoses (the secret of ‘Greek Fire’ that has never been solves) this helped keep them in power in Constantinople for 1200 years. Will the London Book Fair still be held then? I’d also strongly recommend the Chora Church (Kariye Musezi) in the west of Sultanahmet. It’s a taxi ride from anywhere but the mosaics are quite breathtaking. If you’re really into shiny Byzantine stuff that the Pammarkaristos Church near Fatih Mosque is also good. Blue Mosque is so-so – Fatih and Suleymaniye are both Sinan specials and really super. Cover up and all that. Walking can be a bit confusing but there’s so much street life – you’ll love it. If you do go to Chora, or anywhere in the Western Districts then get your baklava here – about a third of the price of the bazaar and v authentic. Go for a barbecued fish in pitta bread off the boats on the Sultanahmet waterfront near Sirceki station. Yum yum. Give the stuffed mussels from the street vendors a miss! Other things – ferrying up the Bosphorus is the next thing I want to do, passing Rumeli Hisar and Mehmet the Conqueror’s other fortresses. That was when Constantine IX knew the game was up. Some people not obsessed with Late Antiquity and women called Eudoxia and Euphemia like to go to Istanbul Modern on the Karakoy waterfront (easy tram ride from anywhere). I haven’t been. Don’t know anything about eating out fancy like. I’ve conked out by then.